Visit Massa Organics for a slew of creative recipes using their delicious organic brown rice. Using a ration of 2.5 to 1.5 (liquid:rice) heat liquid be it water, chicken broth, canned tomatoes or other. Put rice, salt and 1 spoon butter or olive oil into an ovenproof baking dish. Add heated liquid and cover with tight fitting lid or aluminum foil to seal so it steams. Bake at 375 degrees for an hour or so. The rice will come out cooked even and a bit chewy. Let cool and use your preferred portion to mix with orange zest and juice, 1 spoon olive oil, honey, sliced oranges, raisins, chopped almonds and thinly sliced shallots or green onions. Serve over greens. 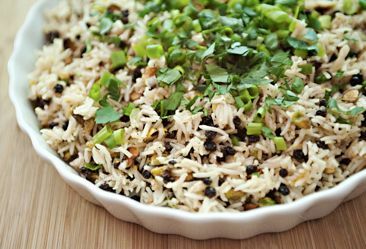 Use leftover rice for various dishes in the coming days.